Albert Adomah put Villa ahead on the hour, steering home his 13th league goal of season from 15 yards. Conor Hourihane's superb dipping left-foot volley then sealed victory. Cheikh Ndoye's stoppage-time red card for a second bookable offence further marred Blues' day. The Senegal midfielder could have been dismissed earlier but he escaped punishment for a challenge on Jack Grealish, before being booked in the second half when he again brought down the Villa winger. He was finally sent off after being part of a kerfuffle in the dying seconds. Blues' best chances came before the break, when they hit the post through Sam Gallagher, and they were again denied by the woodwork when Marc Roberts' late header came back off the bar. 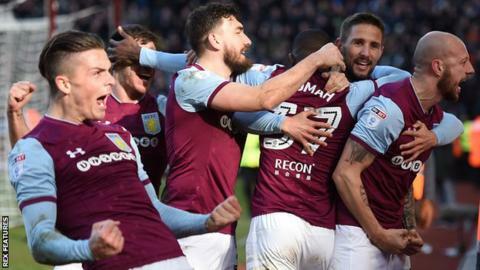 But, in a week marred by the loss of his father, Steve Bruce's Villa were much the better side against his former club, hitting the woodwork three times, the best effort from Scott Hogan. For Steve Cotterill's Blues, who have looked a much improved side of late, it was only their second league defeat in eight games, to leave them just two points clear of trouble. Villa, by contrast, are now into the automatic promotion places - one point clear of Gary Rowett's Derby, but 12 behind leaders Wolves - after winning seven straight league games for the first time since finishing top flight runners-up under Graham Taylor in 1990. The first half belonged to Villa, who carved out a succession of good chances. From a lovely move out of defence orchestrated by a great first-time pass by John Terry, Hogan cut in to smack a right-foot volley against the bar. There were three clearing headers by Blues defenders from almost underneath their own bar, and Hogan had a close-range effort blocked after Grealish and Adomah had opened Blues up. Adomah also cut in to unleash a fierce right-foot shot which was parried by Birmingham keeper David Stockdale, before then firing a low effort just wide. Yet it was Blues, despite being hampered by an injury to David Davis, who wasted the best chance of the half. Terry slipped after being tricked by Jacques Maghoma's beautifully steered through ball, allowing Gallagher clear down the right on goal, but the on-loan Southampton striker's low right-foot shot came back off the post, before he ballooned the rebound over. Villa's class finally told when, fed by Grealish's perfectly weighted pass inside, top scorer Adomah cut in from the left to slide a low right-foot shot in off the despairing Stockdale's right post. But the best was still to come when Hourihane chested down a half-clearance before powering forward to score a stunning second. The match ended in an ugly mass confrontation following Ndoye's altercation with a grounded Mile Jedinak, followed by heated words with Terry - but only the two cards - both for Ndoye, a yellow, and then an accompanying red. "Steve Bruce came in on Saturday. It was the first time the players had seen him this week and, from then, it's all been normal. He picked his team and picked his subs. "He's a very family-orientated man but he's managed to control everything that's gone on in his personal life. "He gave an excellent half-time team talk in terms of keeping them focused and calm, telling them 'don't be disappointed', that we just had to produce what we'd already done. And the goals came. A shaft of light. A moment of happiness. "Derbies are good games to win and we're on a good run of derby wins. We'll enjoy the elation but we're all aware of what lies ahead. We have the future to take care of." "Quality, experience, belief. We weren't quite good enough to take them on. "It was a bit big for a few of our younger boys. They have not performed as they have done in recent weeks. "The way we've been playing, it gave everyone more belief that we could come and do something, that's why the disappointment is bigger. But we weren't good enough to take on a really experienced team. "If Sam Gallagher's shot had gone in, it might have been different. But you just hope that this was a one-off as we've not shown a lot of anxiety over the last two months." Match ends, Aston Villa 2, Birmingham City 0. Second Half ends, Aston Villa 2, Birmingham City 0. Second yellow card to Cheikh Ndoye (Birmingham City). Attempt missed. Cheikh Ndoye (Birmingham City) header from the centre of the box misses to the right. Assisted by Marc Roberts. Marc Roberts (Birmingham City) hits the bar with a header from the centre of the box. Assisted by Jota with a cross following a corner. Corner, Birmingham City. Conceded by John Terry. Attempt blocked. Birkir Bjarnason (Aston Villa) left footed shot from the centre of the box is blocked. Assisted by Robert Snodgrass with a cross. Substitution, Aston Villa. Glenn Whelan replaces Albert Adomah. Attempt missed. Robert Snodgrass (Aston Villa) right footed shot from the centre of the box is close, but misses to the left. Assisted by Lewis Grabban. David Stockdale (Birmingham City) wins a free kick in the defensive half. Corner, Aston Villa. Conceded by Carl Jenkinson. Substitution, Aston Villa. Birkir Bjarnason replaces Jack Grealish. Substitution, Birmingham City. Che Adams replaces David Davis. Goal! Aston Villa 2, Birmingham City 0. Conor Hourihane (Aston Villa) left footed shot from outside the box to the bottom left corner following a set piece situation. Delay in match Albert Adomah (Aston Villa) because of an injury. Albert Adomah (Aston Villa) wins a free kick in the attacking half. Foul by Carl Jenkinson (Birmingham City). Substitution, Aston Villa. Lewis Grabban replaces Scott Hogan. Attempt missed. James Chester (Aston Villa) header from the centre of the box is high and wide to the left. Assisted by Robert Snodgrass with a cross following a set piece situation. Corner, Birmingham City. Conceded by Albert Adomah. Jack Grealish (Aston Villa) wins a free kick on the right wing. Attempt blocked. David Davis (Birmingham City) right footed shot from outside the box is blocked. Attempt missed. Robert Snodgrass (Aston Villa) left footed shot from outside the box is high and wide to the left. Assisted by Mile Jedinak. Attempt blocked. John Terry (Aston Villa) right footed shot from the centre of the box is blocked. Corner, Aston Villa. Conceded by David Stockdale. Attempt missed. Conor Hourihane (Aston Villa) left footed shot from outside the box is close, but misses to the right. Assisted by Jack Grealish. Goal! Aston Villa 1, Birmingham City 0. Albert Adomah (Aston Villa) right footed shot from the centre of the box to the bottom left corner. Assisted by Jack Grealish. Cheikh Ndoye (Birmingham City) is shown the yellow card for a bad foul.